I don’t really like a lot of “paleofied” baking, mostly due to the large amounts of almond flour that gets used. It is very easy to overeat almonds when eating baked goods that use almond flour, and lets face it, a cookie is a cookie even if it is a gluten-free, “paleo” one. Having said that, my kids LOVE cookies, so I do bake them for them for occasional treats. I feel that the odd cookie once in a while makes you happy… just don’t eat these every single day. These are not nut free, but they are gluten, dairy and egg free. 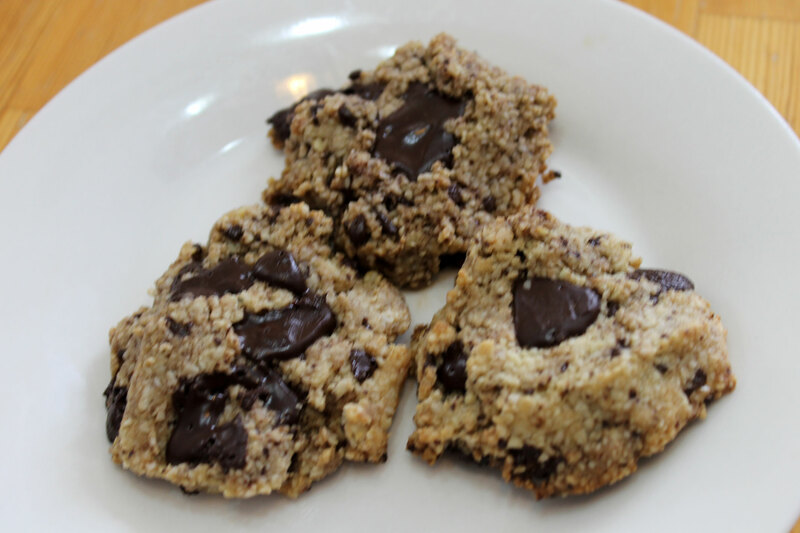 Because these cookies contain almonds and chocolate, they are an AIP stage 2 reintroduction. When reintroducing foods on the AIP, I recommend this guide. In a food processor, combine the almond meal, salt and baking soda. Pulse in the coconut oil, maple syrup and vanilla until you have a sticky dough. Transfer the dough to a bowl and mix in the chocolate chunks by hand (the food processor will break them up too much). Place the dough in the refrigerator for 30 minutes to allow it to firm up. This makes it easier to handle and stops the cookies from spreading too much. Once the dough has chilled, scoop out tablespoon sized balls of dough onto a baking sheet lined with parchment paper. Using your hands, press each scoop down gently to achieve a fat cookie shape. Bake in the preheated oven for 8-10 minutes until browned. Allow the cookies to rest on the baking sheet for 10 minutes to firm up slightly and then transfer to a wire cooling rack. Once they are completely cold, store in an airtight container. 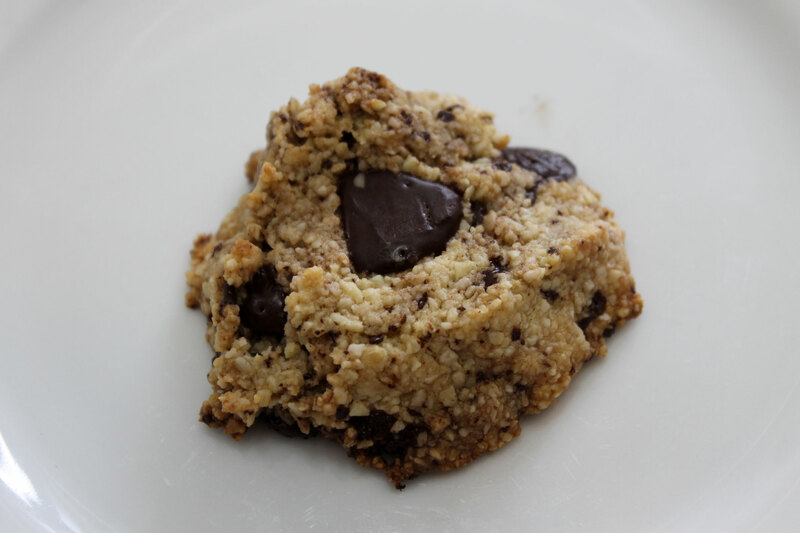 This entry was posted in Recipes, Stage 2 Reintroduction and tagged dairy-free, gluten-free, grain-free, paleo, paleo-treat, primal. Bookmark the permalink.